Darragh MacAnthony (right) and Dave Robertson watching the Development XI this week (March 9). Photo: Joe Dent/theposh.com. Peterborough United chairman Darragh MacAnthony has today (March 10) placed his faith in the management of Dave Robertson for the foreseeable future. No ‘exact-length’ contract has been offered or signed, but MacAnthony has announced that he is, for now at least, not looking outside the club for the successor to Darren Ferguson. 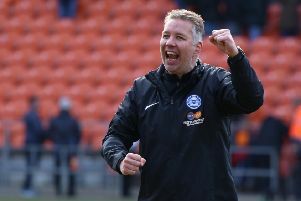 Posh have won all three League One matches since Robertson, assisted by coaches Grant McCann and Aaron Mclean, assumed caretaker-manager duties. MacAnthony has held meetings with all three members of his current management team and told them to concentrate on delivering decent results. He’s also told his players to keep on winning games if they want Robertson to enjoy a longer stay as Posh manager. MacAnthony said: “The manager’s job is not an issue right now. I have simply told David, Aaron and Grant just to get on with the job they’ve been doing for ‘x’ number of games. There are 11 games left this season, hopefully 14, and we are planning for them, but we’re also planning budgets and things for next season. “If the players want this management team to continue then they just have to keep fighting, battling and winning games. Three games doesn’t make a season. We have to keep going as we are and see where it takes us. “I’m not having conversations about the new manager, but I will say I have put to one side the search for another one. I had originally planned to start looking through the 200 or so applicants when I came over this week. I had thought I might interview one or two, but that’s not now happening. “I haven’t even opened the folder with the applicants’ names in. I had a man in mind when Darren left, but he’s no longer an option. I am focussing all my efforts on supporting Dave, Aaron and Grant. “I hadn’t been very comfortable with what was happening at my club, but I am now very comfortable with what I’m seeing. “I’m excited about the immediate future again. We had become very inconsistent as a club over the last 18 months. We had not been reacting well to adveristy. One defeat is just a blip, but we had been turning them into long runs of poor results. “But recent results have relieved the pressure. We have flourished since the changes were made. Football is amazing as in just three games we have momentum and confidence and we are going into games believing that we will win. That’s the feeling I’ve been getting again when I’m watching them. We fell behind at Sheffield United late in the game and yet I sat there believing that we would turn it around and we did. “It’s good to see that we are being positive. It’s good that we have stopped obsessing about the opposition and started concentrating again on our own strengths. “It’s important that we keep going though. I want everyone’s foot to remain on the pedal and it’s full steam ahead for the rest of the season now. “It’s obvious the players are reacting well to David though. They are coming to work with a smile on their faces and I am excited about what this team will do in the coming weeks. “David is a club man. I know for a fact that he could have left this club to work at Premier League Acadamies, but he stayed loyal to us because he loves it here and he wants to build something here. He epitomises the sort of person I love to have on my side as he puts ambition before greed. “David has been with us for a long time. He knows everyone. He’s someone who has a word for everyone and he knows all their names whether they are stewards or parents of players. “He pretty much started our youth set up from scratch. He’s meticulous and he’s well respected. “David has two good men with him as well. I’ve watched Grant and Aaron this week and it’s like watching my children grow up. “They love this club and they were great players for this club, but the second-half of their careers could be even more successful. MacAnthony confirmed that his management team were seeking to bring in players before the transfer deadline later this month. “We are trying to sign one or two and you never know a couple might go out to get experience.